A feed tub for highly productive ewes to be fed as lambing time approaches. Including high quality MOS designed to improve immunity and colostrum quality in the productive animal. The key to a successful breeding enterprise is the production of healthy and lively offspring, using Megastart Ewe and Lamb is a great tool that enables sheep farmers to achieve this. A high intake, free access feed tub used in the 4-6 weeks prior to lambing. 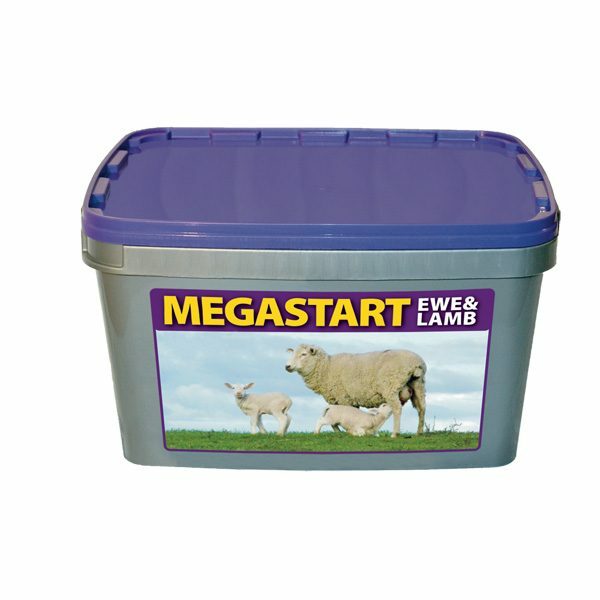 Provides ewes with an excellent source of energy from sugars, starch and protected fat and high quality rumen bypass protein to meet the increased demands of the pregnant ewe. A balanced source of minerals, protein and vitamins, including Vitamin E to improve lamb vigour and Vitamin B1 to reduce problems with CCN. Contains a unique MOS, designed to activate the animals’ immune system and improve colostrum quality. Lactose inclusion provides a readily available carbohydrate source. Feed rate: 100g – 150g head/day, fed for last 4-6 weeks pre lambing.